Like pizza or tacos, the modern burger is more of a concept than a well-defined dish. Put a beef patty (or turkey or veggie) on a bun (or Texas toast or romaine lettuce) and top it with lettuce and tomato (or kimchi or shortribs or grilled pineapple). The burger is a blank canvas, a simple dish with endless variations and embellishments. It is also a food that seems to transcend cuisines, popping up on the menus of fast food joints and white-linen establishments alike. Burgers have long been my go-to guilty pleasure. After a particularly unpleasant day, few things reassure me that everything will be okay like a juicy hamburger and a frosty beer. In fact, as the deadline for this very article crept up on me, I went for burgers with friends at Aspinwall’s charming Tavern-in-the-Wall. While the Tavern ‘Burgh’er, which was loaded with bacon and a fried egg, might not have been so good for my arteries, it did wonders for my soul. On the list below, you’ll find nine more bars, restaurants, and dedicated burger joints cranking out Pittsburgh’s best burgers. I was not immediately sold on the idea of an espresso and rosemary burger. I like those flavors well enough on their own, but together? And on a burger? Half a bite in, my skepticism gave way to pure, carnivorous satisfaction. Espresso and rosemary pair perfectly well, as it turns out, especially when there’s aioli and bacon involved. The burger, a mainstay on Bar Marco’s dinner and brunch menus, is certainly indulgent, but small enough to keep you from feeling like a disgusting pig who doesn’t belong anywhere near this über-hip cocktail bar. Digging in at BRGR. Photo by Brian Cohen. BRGR was one of the first spots I ate at when I moved to Pittsburgh. I remember a puzzling name (is it pronounced “brrgrr”? 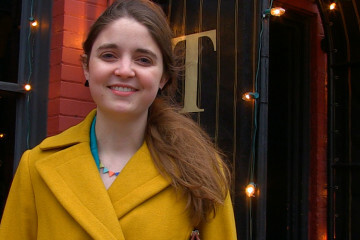 ), warm service, and monstrous, inventive burgers. A few years later and they’re still doing their thing. 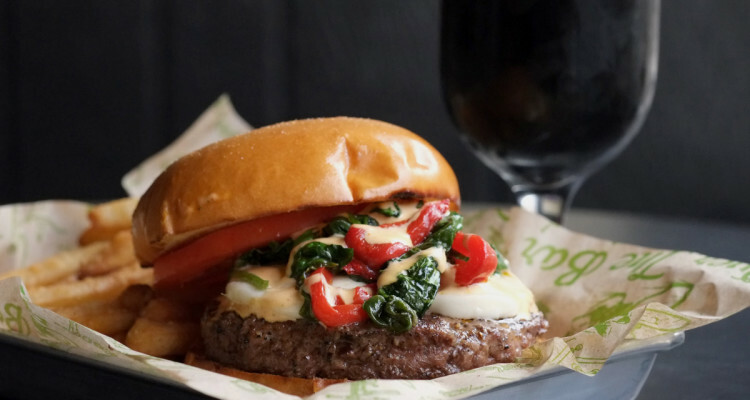 Now, though, you can eat those burgers at three locations—including one in PNC Park—or get them from the splashy, enormous BRGR truck. Offerings range from the exotic (shrimp burger, anyone?) to the ultra-Pittsburghy Double Yoi, a multi-napkin marriage of a burger and a Reuben. BRGR walks the line between fast food decadence and five-star flair, and that is a tasty line indeed. 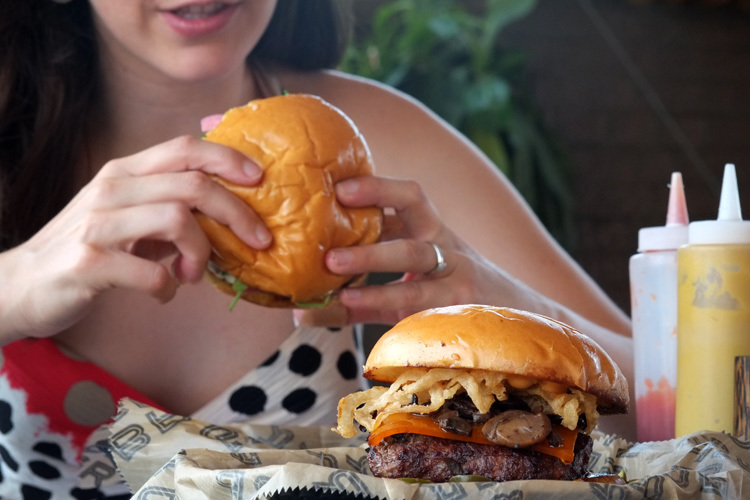 You don’t need me to tell you about Burgatory. Judging by their wait times and noise level, everyone in the greater Pittsburgh area eats there several times a week. With four bopping locations and more on the way, Burgatory is reclaiming the much-maligned title of “chain restaurant.” They’ve got all the hallmarks of a successful chain with their irreverent, family-friendly atmosphere and infinitely customizable menu, but unlike many of their bigger brothers, the food is actually good. Try one of their house burgers, or select the exact patty-bun-sauce-topping combination you want. And if, somehow, you still have room, there are always those spiked shakes. There is no better hangover cure than a Hambone’s burger. It’s a greasy, juicy bar burger, the perfect panacea after a long night of drinking or a particularly head-pounding Sunday afternoon. Just like the Lawrenceville dive itself, the burger isn’t flashy or particularly beautiful to look at. It is, however, cooked and seasoned expertly, and the basic lettuce-tomato-onion trio is always fresh and crisp. If you want to get a bit fancier, there’s the Krusty Burger—the entire patty is battered and deep-fried. You might want to hang on to that one for emergencies. I originally planned to do a ranked list, then decided that was too hard and just put everything in trusty alphabetical order. I had my number one spot locked, though: Butterjoint. This is the best burger in Pittsburgh, in my humble (but totally correct) opinion. The whizzes in the Legume/Butterjoint kitchen bring fine dining touches to the modest hamburger, sourcing top-notch beef, grinding it fresh every day, and seasoning it aggressively. And that’s just the meat! The rotating “Fancy Burger of the Day” pushes buns to their limit, piling that perfect burger with everything from homemade pimiento cheese to onion jam to their house kielbasa. Once exclusive to Butterjoint, burgers are now on the Legume lunch menu. This is very, very good news. The ever-popular downtown spot offers several tasty burgers on their regular lunch and dinner menus. But the real goldmine, at least for frugal carnivores, comes every Monday at 10 PM. That’s when the Monday Nightcap gets underway. Nightcap features drink specials, DJs, and of course, an impressive burger menu. The classic cheese/ketchup/pickle version is there, but so are non-traditional Asian, Tex-Mex, and Italian renditions. Can’t pick just one? No need to—the burgers are all just five dollars from 10 to 1. Have a flight of burgers for less than the price of your cab ride home. Note: the burger at sister restaurant Butcher and the Rye is also exceptional. OTB burger. Photo by Brian Cohen. Monday nights are a good time to crave a burger. 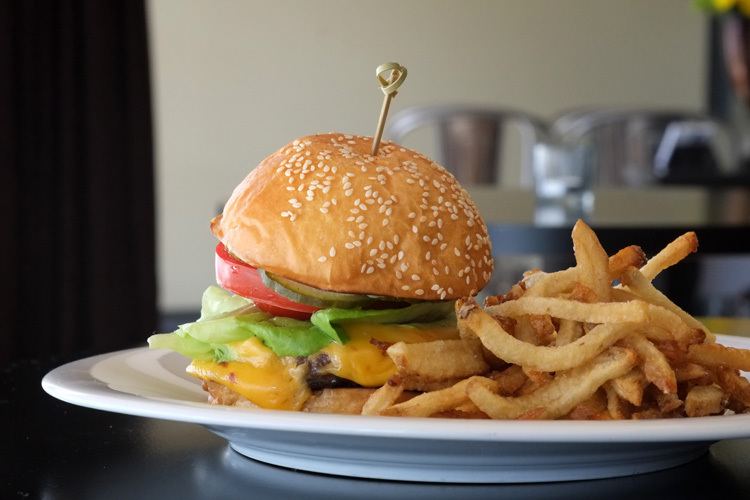 At OTB Bicycle Café in the Southside, the burgers are also just five bucks on Mondays. And if you thought espresso and rosemary seemed a bit pedestrian, try out the Dirt Rag Delight, which comes with American cheese, pickles, and a healthy slathering of peanut butter. It is surprisingly good, as are the ten or so other signature burgers, which can be made with beef, turkey or veggie patties. 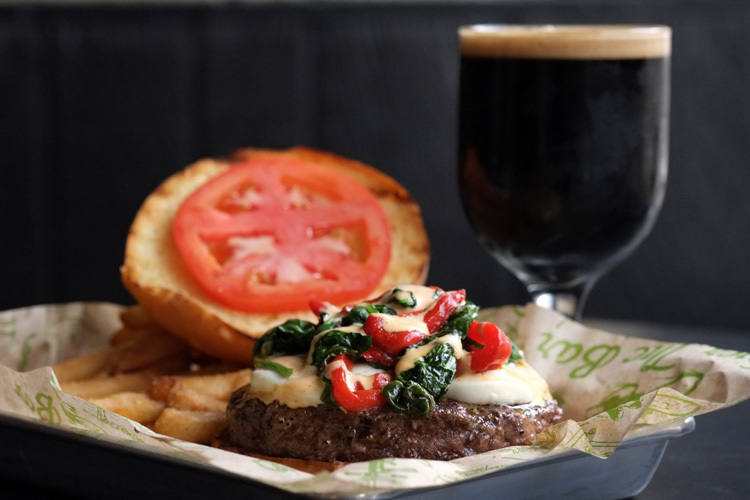 With the recent opening of a new location in North Park, OTB is bringing their quirky burger sensibilities to more Pittsburghers than ever before. Salt of the Earth’s burger. Photo by Brian Cohen. I first had Salt’s late-night burger when Kevin Sousa was still at the helm, so I was expecting some sort of ultra-modern, deconstructed, or otherwise tweezered version of the classic. What I got instead was, well, a burger. Beef, cheese, lettuce, pickles, mustard, bun. What looks like your average greasy spoon burger, though, is anything but. The pickles don’t come from a jar, and even the American cheese is made in house. This is a burger that proves that familiar dishes don’t need to be covered in foie gras and truffles to be restaurant-worthy. Since that first visit, Chad Townsend took over as executive chef and the burger has moved onto the dinner menu. 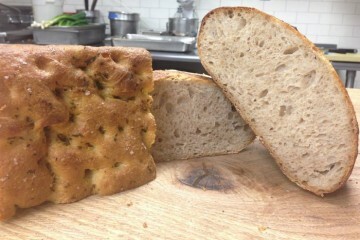 Luckily, it’s still as simple and delicious as ever. I wrestled a bit with including Tessaro’s on this list. On the one hand, how could you make a list of the best burgers in town without mentioning the beloved Bloomfield institution? On the other, is anyone reading this who hasn’t already been there? When I asked around, Tessaro’s was the name that came up over and over again, a knee-jerk reaction to the phrase “best burger in Pittsburgh.” Not that they don’t deserve it. For over a quarter of a century, Tessaro’s has been cooking up classic American hamburgers on their famed hardwood grill. The smell of caramelizing beef is as much a part of the fabric of Bloomfield as the little Italian bakeries and the old timers hanging out on the sidewalk. Got a favorite burger in the ‘burgh? Let us know in the comments below.